I just made this today. I tasted it so I could tell you how it was, even though I’m not supposed to eat wheat. It’s sooooo good! I’m definitely going to have to make a gluten free version! 2 apples, peeled, cored, and chopped. Preheat oven to 350. Grease 2 bread pans. In a large bowl, cream sugar and butter together. Add egg and vanilla, mix well. In another bowl, mash the ripe bananas with a fork, then add to the sugar mixture. In a separate bowl, mix the baking soda & flour together. Add flour mixture to sugar mixture. Mix until all ingredients are moistened. 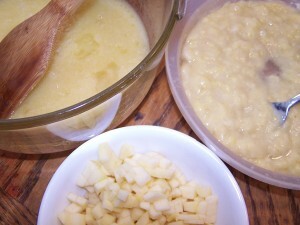 Add chopped apples, stirring until they are incorporated into the batter. Bake at 350 for one hour, covering the tops of the pans lightly with aluminum foil. Remove the foil, bake for 10 more minutes or until a toothpick inserted in the bread comes out clean. *This post contains affiliate links. If you click the link and purchase something, I will receive a small commission. Ok, I can’t wait to try this one!!!! Thanks for leaving your post here as part of the Living Well link-up! We appreciate the contribution! Well, I read between the lines and was able to figure out what was supposed to happen and made two batches of this for the office and friends. Came out good and am making some more tonight to use up the bananas in the freezer. I have one apple left and then will sub in some shredded zucchini and nuts. Simple, easy and good. My family had severe but allergies and I love to see a recipe for banana that doesn’t have nuts in it! Thank you! That sure does sound good. I’ll bet the house smelled good while it was cooking too. Yummy! Just pinned this as it looks sooo delicious! Perfect timing I have a bunch of overipe bananas I know what I’ll be using them for tomorrow! Oh, I love a good baking recipe. One of my favorite recipes to make is banana muffins. So you know I will look into this recipe. Thanks! That’s a nice change of pace from the traditional banana bread. When apples are in season and we buy a bag I’m always looking for new ideas on how to use them. This sounds amazing! Thanks for the recipe. Will be a must try! Well thank you this sounds like a good recipe. I would love to try it. Thanks. I’m not very good when it comes to baking. I usually end up burning everything. This sounds so good! A perfect treat for this time of year when things get a little boring and you need something different. To some, bread is a classic comfort food. I personally can’t eat much bread because it gives me trouble. I get terribly bloated and full for the rest of the day. That’s after one slice. We have bread at every meal. Probably shouldn’t but we do. This will be a great addition! This looks great, I have tons of bananas. I get them on sale and freeze them. Sunday is baking day for me – This is going on the list. The bread looks a bit dark. I suppose it’s from the cinnamon. This would be good with a glaze or cream cheese frosting. Thank you for sharing this yummy recipe. I will be making some this weekend. 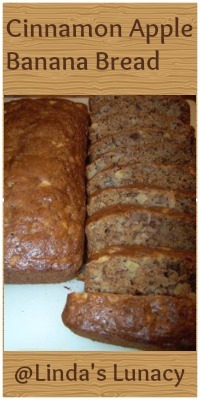 I love banana bread AND apple bread, so this must be outstanding! Baking bread takes practice. I’ve tried a couple of times to make home made bread. It should have been varnished and used as a doorstop. This recipe looks amazing can’t wait to try it! This is making my mouth water. Yum! Thanks for sharing, we always have bananas that are going bye bye around the house here. This sounds like it would make a good french toast. Or some kind of dessert. Maybe with a scoop of ice cream while it’s still warm. Oh, I will make this. It won’t last long enough to cool off. This recipe is a real winner! I love a good recipe to start the day. Yum. I will have to save this for the weekend. I make banana bread a lot. I will have to try it with apples in it to see if we like it. WOW! That’s a great recipe incorporating two of my favorite fruits, apple and banana, then throw in some cinnamon and you’ve really taken it to the next level! 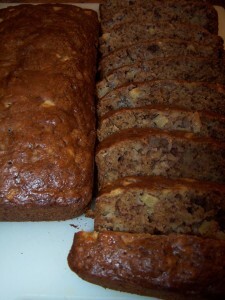 Thank you for sharing your recipe for Cinnamon Apple Banana Bread! This recipe would be good with chopped nuts, and some chocolate or cinnamon chips in it. I suppose the banana makes the bread moist. Anything with bananas are a big hit in my house. My family will eat anything banana related. I really like this recipe. I should try it as a good snack/treat this weekend. This would be a nice bread to mail to someone you care about. Looks great and will give it a try sometime soon. The recipe looks delicious! I would add nuts and precut slices for an easy snack to grab and go. This looks like a wonderful fruit bead. Can’t wait to try this great sounding recipe. You are making this pregnant lady drool right now! I love apple, cinnamon and banana, so the fact that they’re all hanging out together in this bread is really bad news for me. Thanks for sharing this yummy recipe, I WILL be making this, hopefully it turns out great! I love this recipe, I’m definitely going to try this. Looks like a very straightforward recipe. I love good recipes especially if it is for something to bake. Oooooo I will be making this!!!!!! It sounds amazing!!!!! This sounds so good and something I will try. I have never made it with apples. This bread looks so good. I am going to make it this weekend. I am pinning this on Pinterest, I have to try it. Thank you for the recipe! We love to fry banana bread in a frying pan, you just slice, butter and fry it! YUM! We have that for breakfast, with coffee. I will try this, and not tell my hubby, and see if he can taste it. Just made this, smells amazing! Ingredients calls for cinnamon and nutmeg but does not tell you in the directions when to add them. I added mine with the flour. It’s in the oven now. We’ll see!